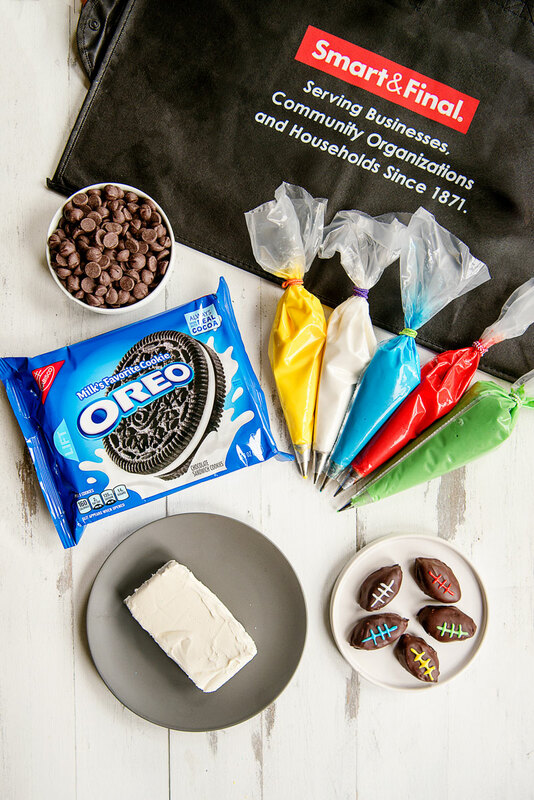 You only need a few ingredients to make these chocolate dipped OREO footballs. 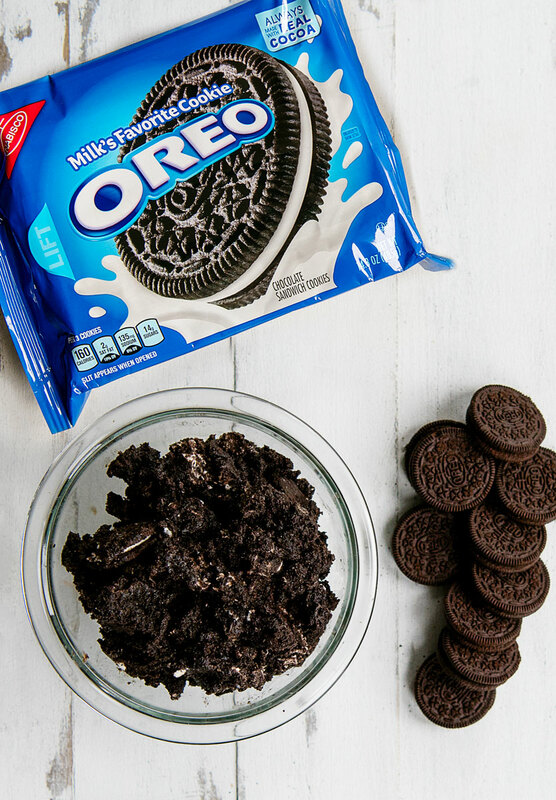 The first step is crushing the OREO Cookies and mixing them with cream cheese. I used a food processor for this step but you can also do it by hand. 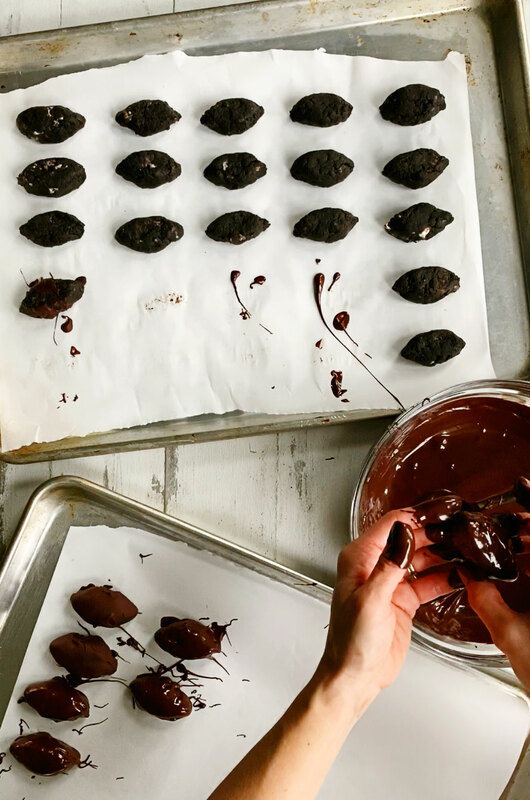 Once chilled in the freezer, shape the mixture into small footballs. 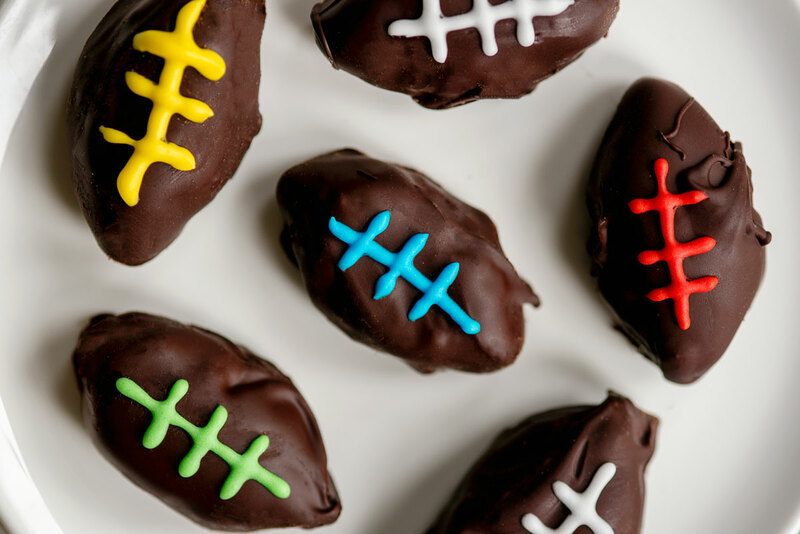 Melt the semisweet chocolate and dip your footballs into the melted chocolate. This part gets a little messy, so make sure you do it over a baking dish or on a surface that is easy to clean. 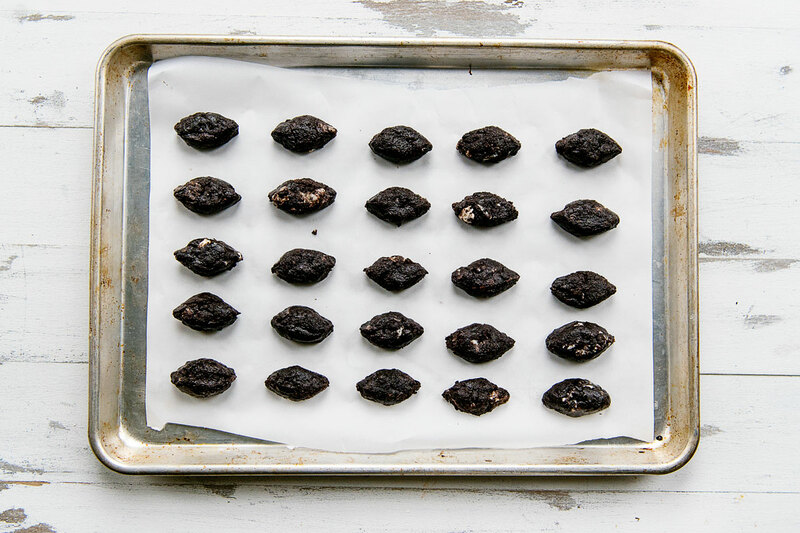 Place on a wax paper lined baking sheet and let harden in the fridge. 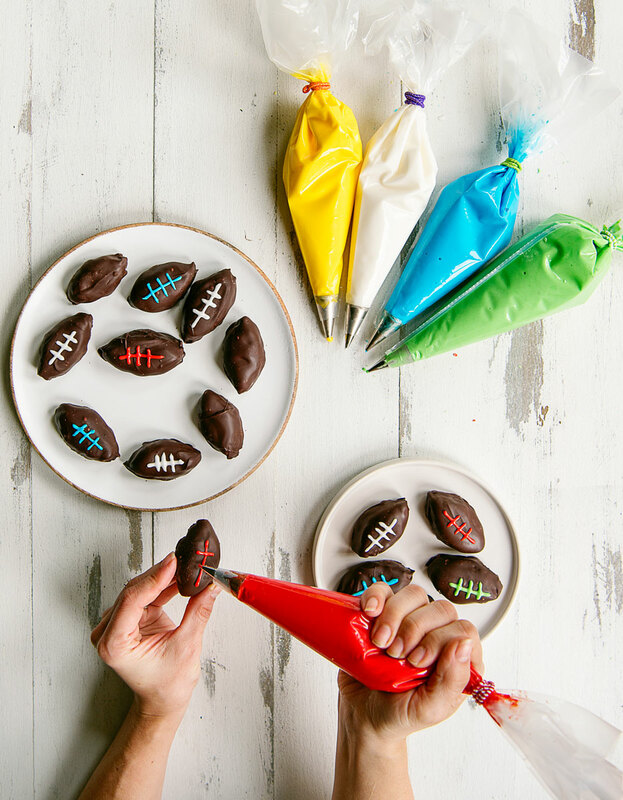 The last step is piping lines on your little footballs using decorating icing. You can also use melted candy melts. I used a piping bag with a size 0 round tip. You can also use a resealable sandwich bag with one corner snipped off. If you are doing this only cut off the tiniest section – about 1 millimeter. Get the full detailed recipe instructions below. 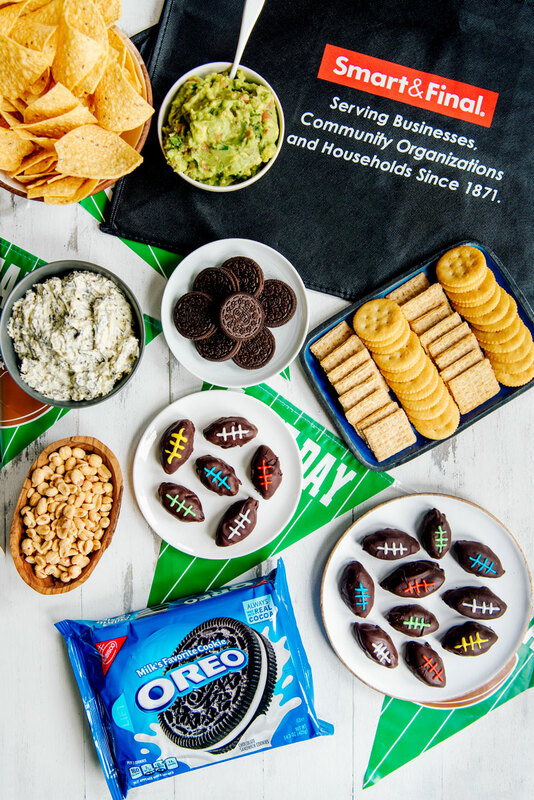 It can be overwhelming to plan a football watching party, but never fear! Here are a few handy tricks you can use to decrease stress and also minimize your workload on game day. Find a one stop shop. We use Smart & Final for a one stop shop for all our hosting needs. You can find everything from snacks to fresh produce all at a great value. Don’t forget to stock up on paper plates and napkins – they have a huge assortment of colors to choose from. See more easy Big Game Recipes that will make you the MVPH (Most Valuable Party Host) on Pinterest. Skip the silverware. When I’m planning a party menu, I focus on appetizers that don’t need utensils. Finger foods for the win! 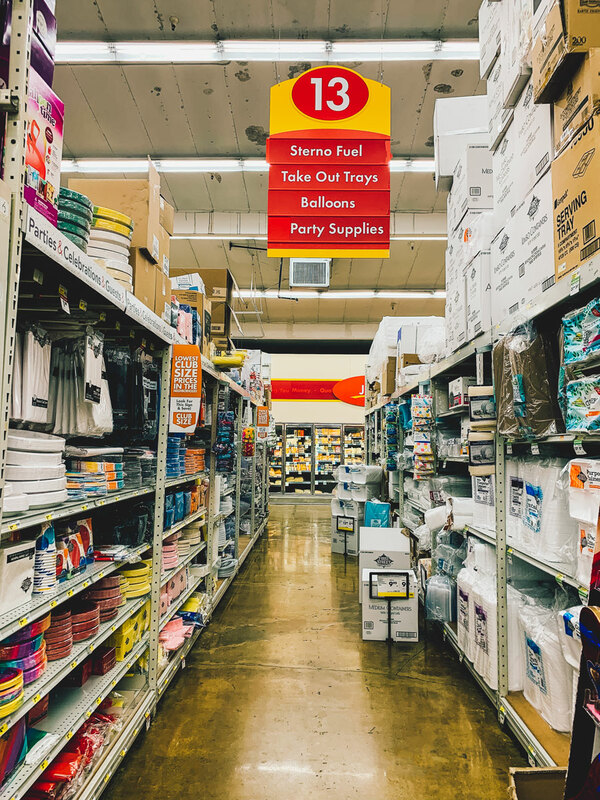 Cutting down on plastic party supplies is also the environmentally friendly choice. Boost your seating. Have throw pillows and blankets handy to offer extra seating options for your guests once the game gets started. 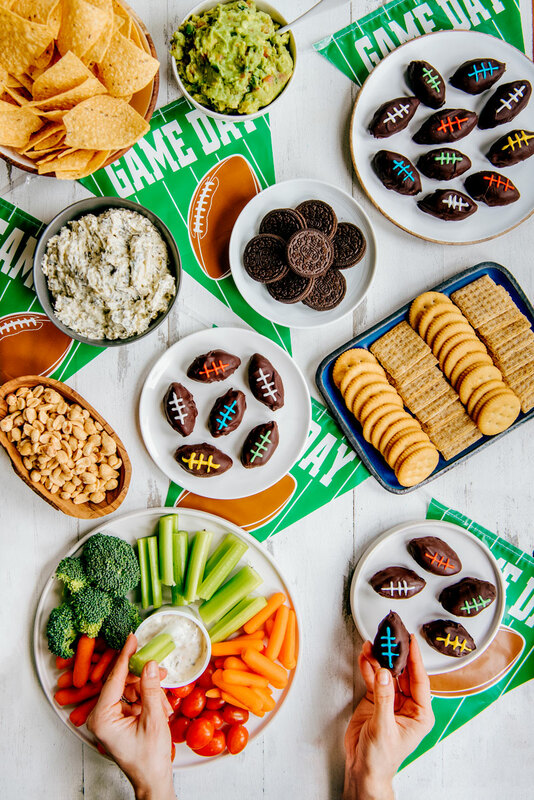 Stock up on Staples: It’s hard to imagine a game day party without staples like a veggie platter and RITZ Crackers. 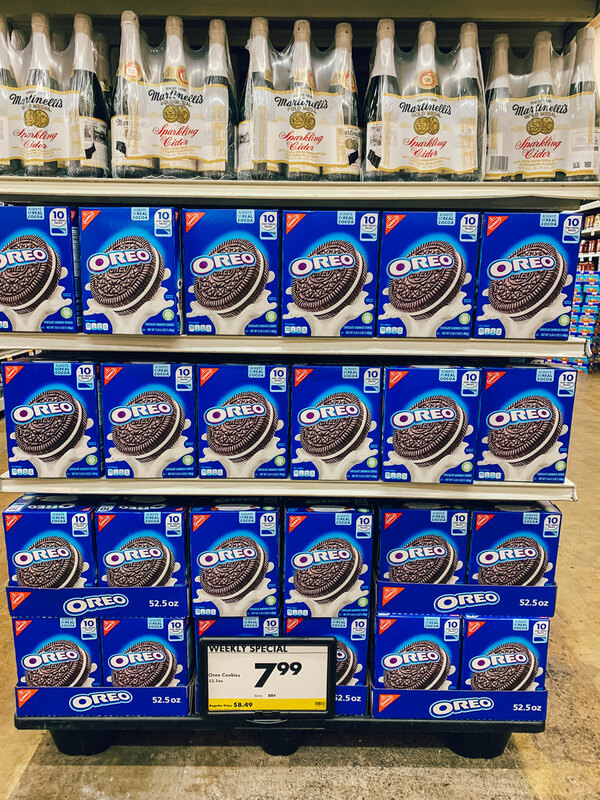 Smart & Final had a special on OREO Cookie 10-packs when I visited, which is perfect for hosting a large crowd. 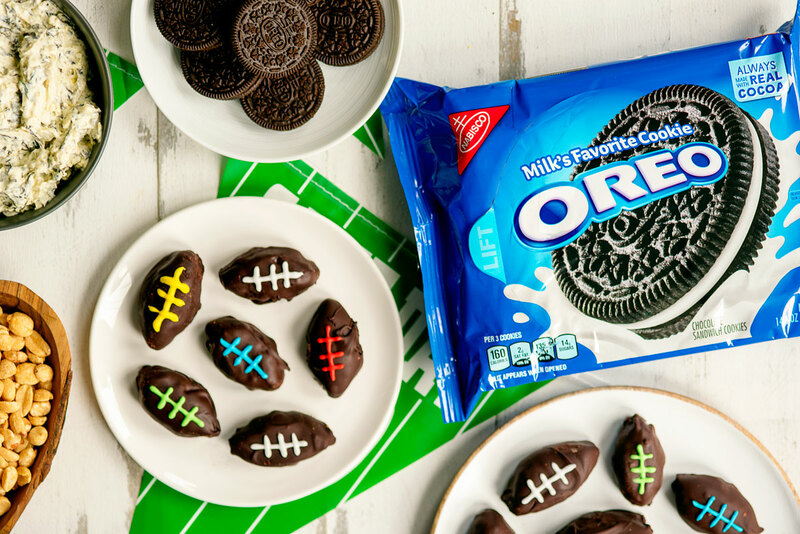 Team Spirit Themed Foods: Your guests can declare their team loyalties by choosing OREO footballs in their team’s colors. 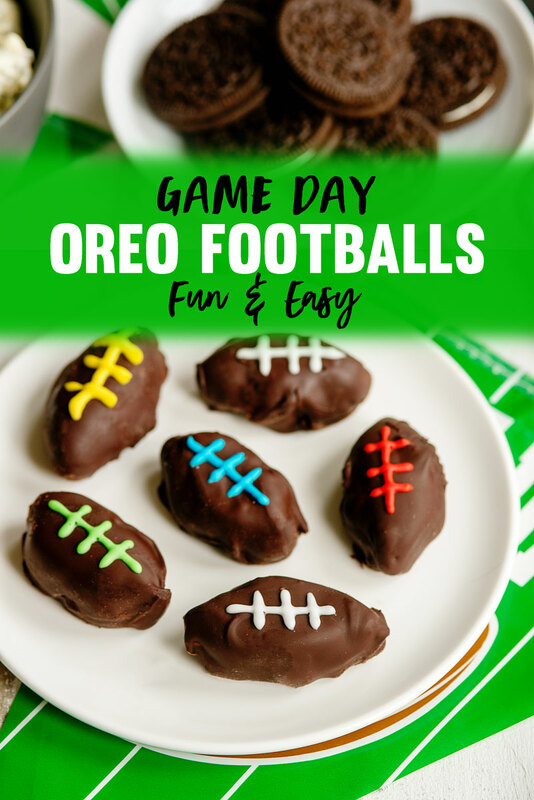 You can also choose colored candy melts for these White Chocolate Dipped OREO Cookies that represent the colors of your favorite football teams. This post is sponsored by Nabisco. 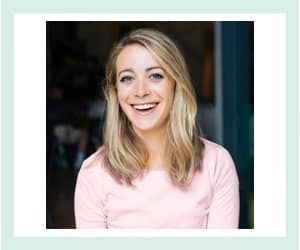 Thanks for supporting the sponsors that allow me to bring you beautiful and delicious content! I made these on Sunday and they were AWESOME. Totally devoured by my guests. 10/10 recommend! How can these taste so good! 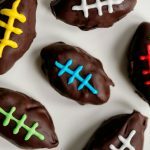 I used store bought icing to make things easier and they were a hit. My family wants them again but in heart shape for Valentine’s day.